PLANET Technology Long Reach PoE Solution enables all enterprises and network service providers to set up an IP infrastructure in a remote location where 802.3af/at PoE compliant powered devices can receive both data and power via PLANET switches, and PLANET LRP extenders and injectors over a long distance but not limited to the normal 100 meters. 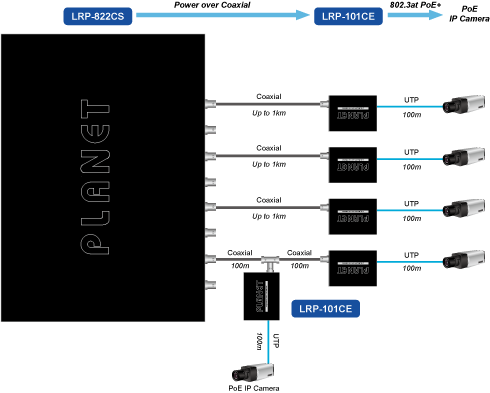 PLANET LRP-101CE, a PLANET Long Reach PoE solution, is a single-port 802.3at PoE+ Extender that is installed at a remote location connecting to an PoE IP camera or PoE wireless AP. The LRP-101CE has to work with PLANET single-port Long Reach PoE Injector or Multiple-channel Long Reach PoE Switch to be able to simultaneously transmit both data and power to a PD over a distance of up to 1,000m (3,280ft) over coaxial cable. The LRP-101CE provides a maximum of 25-watt power output over Ethernet cable to a remote PoE IP camera, PoE wireless AP or access control systems complied with 802.3af/at PoE. PLANET Long Reach PoE solution can easily build a power system for centrally-controlled IP cameras in a high availability network infrastructure. It gives users the flexibility to expand small area network with BNC T-connector for sharing four nodes per port when needed. A normal UTP cable can only be extended up to 100 meters, but the LRP-101CE, when working with the LRP Injector or LRP Switch, can extend PoE networking up to 1,000 meters (3,280ft) over 75 ohm coaxial cable with stable, high-quality video transmission. It eliminates the need for an additional electrical outlet as its single power source can provide power to a PoE PD at long range via the LRP-101CE. 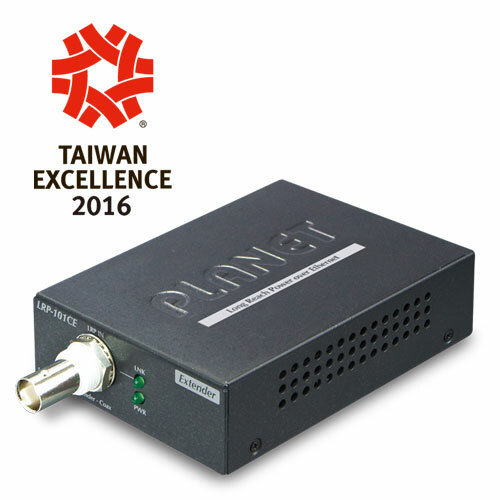 PLANET Long Reach PoE Extender is the perfect solution for extended data and power transmission for warehouses, parking lots, campuses, casinos, and many more. It can operate stably under temperature range from -20 to 70 degrees C which enables the users to conveniently apply the device in any harsh environment. Without the problem of power source, it makes the installation of remote PoE powered devices easier and more efficiently. With the plug and play feature, the LRP-101CE can be used immediately without the need of configuration and is also compliant with all kinds of IP network protocols. If there is a network disconnection, it can be re-connected in less than 5 seconds. Moreover, the rich diagnostic LEDs on the front panel show the operating status of the individual port and the whole system, enabling the administrator to efficiently manage the network. Working in pair with PLANET LRP-101CH Long Reach PoE Injector, powered by either the external DC power adapter or PoE+ Ethernet switch, the LRP-101CE’s 802.3at standard PoE output goes to a PoE PD. The LRP-101-C-KIT, made up of the LRP-101CH and LRP-101CE, can be widely used in Intelligent Transportation Systems (ITS), traffic surveillance, security monitoring, automation control, intelligent residential districts and so on. The LRP-101CH injector, powered by IEEE 802.3at/af PoE source, transmits data and power over coaxial cable to the LRP-101CE extender. An IEEE 802.3at/af compliant PoE PD will then automatically be powered by the LRP-101CE via UTP cabling. The LRP-101CH injector, powered via the DC power adapter, transmits data and power over coaxial cable to the LRP-101CE extender. An IEEE 802.3at/af compliant PoE PD will then automatically be powered by the LRP-101CE via UTP cabling. Powered by the Long Reach PoE Switch via coaxial cables, the LRP-101CE can automatically deliver power and data to the IEEE 802.3at/af compliant PoE PDs via UTP. It successfully eliminates the need for an additional power source for the LRP-101CE and the PoE PDs at long range.